Miramax has outdone itself. Not only has it released DVDs of three of the best films of all time, it supplements them with a wealth of information about their creation and their lasting importance to film history. Polish director Krzysztof Kieslowski ended his glorious career with a trilogy of intimate dramas exploring the three ideals of the French Revolution, using the three colors of the French flag. 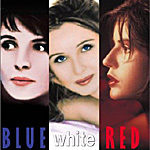 In Kieslowski’s interpretation, blue, white, and red represent liberty, equality, and fraternity. His films tackle these ideals, not head-on, but obliquely. In Kieslowski’s view, liberty is not all it’s cracked up to be, revenge can stand for equality, and fraternity is another word for love. Blue represents liberty. The saddest of the three films, Blue explores the loneliness of independence and liberation from an internal prison. Julie (Juliette Binoche) loses her husband and her daughter in an accident. Her grief is devastating, and she can do little but mourn. Her husband was a composer. His symphony for the unification of Europe was left unfinished. She also discovers that he had a mistress, who is now pregnant with his child. Although these facts only add to Julie’s pain, they both eventually offer her a reason to come out of her self-imposed isolation and sorrow. White represents equality. It is a comedy, although the comedy is so subtle you may miss it. Karol (Zbigniew Zamachowski) is a Pole living in Paris. His wife Dominique (Julie Delpy) leaves him because he can’t consummate their marriage. Without a French wife, Karol loses his citizenship, his bank account, everything. He returns to the newly-democratic Poland to rebuild his life. He becomes a shrewd and ruthless businessman, but he hasn’t forgotten Dominique’s betrayal. He is prepared to use his new wealth and status as revenge. Red represents fraternity. Red earned the most attention and praise (it was nominated for the Best Picture Oscar; the others were not). Kieslowski himself called Red the best of the three, although I place it below the other two as the least focused and intense of the trilogy. Valentine (Irene Jacob, who worked with Kieslowski on The Double Life of Veronique) hits a dog with her car. She tracks down its owner and finds a retired judge who listens in on his neighbor’s private telephone conversations. The two develop an unexpected friendship, connecting with each other in ways that neither can seem to manage with their more traditional peers. If pressed to name the best-made film I’ve ever seen, I would probably name Blue, encouraging the asker not to miss White and Red as well. Kieslowski was at his peak when he made Three Colors, and his lifetime of experience really shows. Not a single shot is wasted; not a camera move — of which there are many — is gratuitous. An example springs to mind. Early in Blue there is a car crash. A young man is hitchhiking and the doomed car drives past him. He hears the accident and runs toward the crash. The plot doesn’t even require his presence. At most, it requires him to get up and run toward the car. But with minimal expenditure of screen time, Kieslowski bothers to show us the details. He shows us exactly what is going on in the young man’s head, rather than just showing a young man running. The youth is playing with a stick-and-ball puzzle, indicating his boredom. He just manages to catch the ball on the stick when the car crashes — delight and then surprise. He gets up very slowly, and the camera shows us a close-up of the kid deliberately picking up his skateboard as he wonders whether he should really go investigate. The next shot shows him running, and halfway to the car he tosses his skateboard aside, finally forgotten in the sight of the terrible crash, the realization that he’s the only witness, the only help. The example is just one of many that a critic could cite to show Kieslowski’s obsession with detail. But a collection of details does not necessarily make a coherent whole. In Kieslowski’s case, however, it does. Each film tells a relatively simple story, and each of those stories is fundamentally about a relationship. Most directors would film such simple stories with lots of expository dialogue, but Kieslowski instead builds the stories “from the outside in,” (as Jacob says in one of her interviews). Blue, for example, has very little dialogue because the heroine is all alone. So instead of her telling us what’s going on in her mind, Kieslowski shows us, by showing her behavior, her reactions, and her literal point of view. White has a moving, dramatic finale where the two characters cannot speak to each other. Karol looks at a distant Dominique through binoculars. To communicate, she makes a series of cryptic gestures that only tell half of the story. Their faces and expressions tell the other half. You could say that Kieslowski trusted his audience to understand the big picture if you give it enough information in the details, which he does. I was able to compare the DVDs to the LaserDisc releases, and the DVDs are much better. The better resolution and more stable picture can probably be attributed to the nature of DVD (rather than to the quality of the transfer). The discs don’t say whether they are made from a new transfer or from an existing one. If there is a difference, it is only evident in the color quality, which is a little more naturalistic and less cartoonish on the new DVDs. Sound, too is better on the DVDs. There is better separation of dialogue and music across the front speakers than there is on the LaserDisc. The only drawback is that the subtitles still appear over the picture — rather than in the letterboxing bar below. Whatever the extra features lack in quality, they make up for in quantity. There are recent interviews, interviews conducted a few years ago, and interviews from the time of the films’ theatrical releases. There are commentaries over the films and over selected scenes. There are behind-the-scenes scenes and student films from Kieslowski’s days at the Lodz Film Institute. It’s impossible to digest all of these features all at once. After three or four sittings, I only made it through about two-thirds of them. The DVDs’ menus leave something to be desired. First of all, each time you put the disc in your player, the menu is disabled while about 10 seconds of music from that film plays. This is fine the first time. But subsequent times, the delay is an annoyance. Second, the extra features are spread out over two screens, but the only indication that there is another screen is a subtle little “>” character that I completely missed on the first two discs. The word “more” would have been unambiguous and impossible to miss. Miramax conducted and/or acquired several interviews for the DVDs. Among the interview subjects are each of the three leading ladies, two of the three cinematographers, film critic Geoff Andrew, and editor Jacques Witta. The star interviewees are Agnieszka Holland, a close friend of Kieslowski’s and a director in her own right (Europa, Europa, The Secret Garden); and Annette Insdorf, a film professor and friend of Kieslowski who had even translated for him at various festivals and functions. There is a lot of footage of these interview subjects, enough for each disc to have about three documentaries made from it. Some of the footage is re-used in other documentaries, which shows that Miramax was more interested in quantity than quality. Although there are some good insights, often interview subjects will make vague, broad statements about the films or about Kieslowski that are of little interest. Also, sometimes two “experts” will subtly contradict each other about what to make of a particular scene. Highlighting these contradictions would have made an interesting segment on the disc, but instead, you’ll just have to pay close attention. Kieslowki scholar Annette Insdorf, who appears in some of the video interviews, provides the audio commentary for all three films. I didn’t have time to hear all 300 minutes of her insights, but what I did hear was better than the average commentary track. Because she is a scholar and not a filmmaker, Insdorf provides commentary that has more to do with how to read the film and its importance to film history than with what the weather was like on a particular day of shooting, or whose cousin played which extra. Some of her comments are mere narration. She tells in her own words what we can see for ourselves on the screen. But these moments of obviousness are never left to hang. They always continue on to an important point being made about a character or about Kieslowski’s technique. The absolute best extras on these discs are the segments called “Kieslowski’s Cinema Lesson.” Each disc features one scene from the film that Kieslowski himself then deconstructs. He sits in front of an editing machine and runs the scene backwards and forwards, showing an unseen interviewer what went into it and why. Because Kieslowski died only two years after completing Red, this footage must be at least eight years old. How fortunate we are that it survives. Miramax deserves congratulations for giving these films the treatment they deserve. They are among the best films made in the last 20 years, perhaps some of the best ever. The wealth of information on these DVDs is appropriate to their importance to film history. The only problem is that there is so much information that it’s hard to sift through. The discs would have benefitted from a detailed index, or a separate disc devoted to extra features. Still, for fans and scholars, the Three Colors DVDs are as definitive as you’re likely to find this side of Criterion.